According to the late author and motivational speaker Zig Zigler, “success occurs when opportunity meets preparation.” You never know when you might cross paths with someone who could impact your career or become your next big client. So, it’s important to have a well-crafted “elevator pitch” ready to go when you need to introduce yourself on the fly. It’s called an “elevator pitch” because you should be able to recite it in the time it takes to ride an elevator from the bottom to the top floor. So, if you run into a potential business contact on an elevator, you want to be able to introduce yourself with the most important information before they or you reach your floor and have to exit. On average, at a regular conversation speed, people speak at a rate of 150 words per minute, and according to an article from the Harvard Business Review, the average elevator ride is about 118 seconds. That means if you run into a potential new business contact on an elevator—or any of a wide variety of similarly time-crunched situations—you only have about two minutes to explain in enough detail why they should be in business with you. Check out these five quick tips for crafting a quick and effective elevator pitch before you find yourself tongue-tied in front of a potential client. Start off like any first meeting by introducing yourself, including your title and company name with a quick qualifier. Next, share some detail about what your role is within the company. This helps put your services in context and shows you have expertise in a range of specific areas. Now, you want to give them the WIIFM, or “what’s in it for me.” Why are your products or services better than the competition? Finally, you should close with a call to action. What do you want to gain from the new business contact? 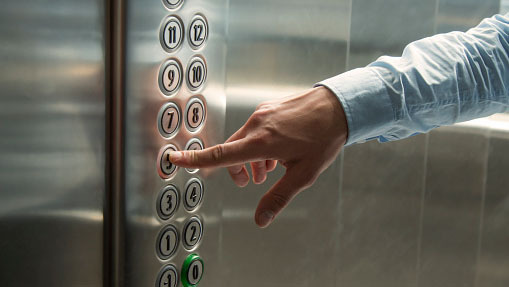 What tips do you have for crafting the perfect elevator pitch? Let us know in the comments section below. Or, if you’d like to share your own elevator pitch, we’d like to hear them! Question of the Month: What Does “Flexible Work” Mean for You? An elevator pitch isn’t just about sales, it can also be a mini job interview or a way to make yourself known to upper management. Hi, I’m John Smith, supervisor of sales for the north region. My team is the #1 team for small business sales this quarter. I’m really proud of them. I hear the company is expanding to a new region over in X place soon. I’d love to be the one to lead the new sales team. or for non sales: I’m John Smith, I work in accounting. You’re on the distribution list for my X report that I send out each week. (blah blah, allow for response) I really like the people I work with. Such a great team of talented people. I’m hoping to move up and take on more responsibility. I have been watching for a position in the auditing department to open up. This is very good information for all sales people to have ready, thanks for putting it in a form easy to follow. 1. If you can, use their name when you speak with them. 2. Be genuine – don’t try to be someone you are not! 3. Make it memorable so they will remember you. Maybe create a clever acronym for what you want them to take with them when you part ways. 4. Don’t forget to hand them a business card, so they know how to get in touch with you. Even better, include the acronym in 3. above on your business card somewhere so it reminds them of your “elevator” talk!